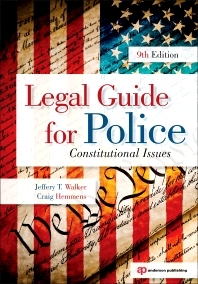 Legal Guide for Police: Constitutional Issues, Ninth Edition, provides an understanding of federal and state laws and court decisions that are essential to law enforcement officers in their line of work. It presents U.S. Supreme Court decisions up to and including the 2009 term of court. The book discusses the effects of failing to comply with constitutional mandates, and it considers the general limitations on police power, emphasizing the common constitutional questions that confront officers when they are called on to enforce the law. It also covers legal standards relating to detention, arrest, search and seizure, questioning suspects, and pretrial identification procedures. This book is a valuable resource for officers tasked with protecting rights, seeking illegalities, and preparing evidence for use in court. It may also be used in departmental training programs and in colleges that offer courses for in-service and pre-service officers. Appendix contains the Bill of Rights and the Fourteenth Amendment. Table of cases lists every case referenced in the text. Students and professionals in the criminal justice field. Jeffery T. Walker is a professor of Criminal Justice and Criminology in the Department of Criminal Justice at the University of Arkansas, Little Rock, where he has taught since 1990. He currently serves as the PhD Coordinator. A past president of the Academy of Criminal Justice Sciences, Walker holds joint appointments with the University of Arkansas, Fayetteville, and the University of Arkansas Medical School. His main areas of interest are social/environmental factors of crime and the study of non-linear dynamics as they relate to crime. Craig Hemmens is professor in the Department of Criminal Justice and Criminology at Washington State University. Prior to arriving at WSU, he served as Chair of the Department of Criminology & Criminal Justice at Missouri State University, and before that as Chair of the Department of Criminal Justice, Director of the Paralegal Studies Program, and Director of the Honors College at Boise State University. He holds a J.D. from North Carolina Central University School of Law and a Ph.D. in Criminal Justice from Sam Houston State University. He has published 20 books and more than 100 articles on a variety of criminal justice-related topics, and has coauthored works with more than 35 different students. His primary research interests are criminal law and procedure and corrections. He served as President of the Academy of Criminal Justice Sciences in 2012-2013.